As Metro EDGE turns 10 this year, and in the spirit of the 10-Year Challenge, we’re looking back at the beginning of EDGE and our roots in Sacramento and how far the organization has evolved. EDGE has paved the way for our region’s best and brightest young professionals to help transform the city and influence the advancement of an innovative and dynamic community. What better way to celebrate a meaningful decade than reflecting back on one of the most iconic places in our city. Like EDGE, the Tower Bridge has evolved significantly over the past 10 years. It’s developed and grown right alongside the city of Sacramento, continuing to change with time to reflect innovation and progress. Since its construction, there's been no landmark more associated with the city of Sacramento than the Tower Bridge, and visitors from around the world are finding it to be the shot to capture of the city during their visit. Perspectives of the Tower Bridge are peppered across Instagram profiles from Sacramento to Australia. Trip Advisor proclaims that "there's gold in that there bridge!" and how it's a "cool spot for a photo!" Luckily for us, photos taken since its construction in 1935 have given us a glimpse at how the bridge has evolved over time. From its beginnings, the city has been home to explorers, settlers, risk takers and leaders. Those citizens have continually powered the momentum of the city, keeping it on a path of progress and innovation. Though the Tower Bridge may not have always existed, its growth and change over time reflect this same spirit. 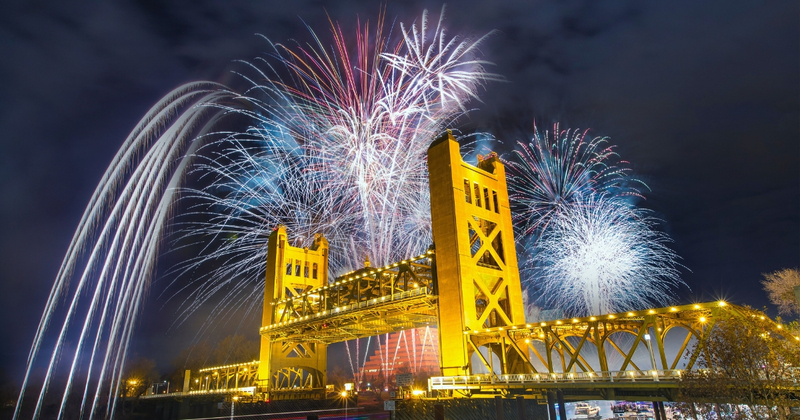 The Tower Bridge we know today was designed in the 1930s to meet the needs of the growing population of Sacramento. It has a Streamline Moderne architectural style which mirrors the era's popular Art Deco architectural design seen in buildings throughout the city. Throughout its life, the Tower Bridge has incorporated a variety of renovations designed to ensure it has met the city's evolving needs. This resulted in the incorporation of a variety of design influences. Similarly, Sacramento is a city representative of many different styles, sometimes contradictory, but united by a desire to be modern. The Tower Bridge has evolved with the city and is always looking towards the future, ready for change. Today, we see the growth of the River District and many other neighborhoods surrounding the bridge. Progress and forward momentum continue. Given the transformation that is happening right now in the city and given how many photos are taken of the bridge day-to-day, it will be fascinating in 10 years to look back on that trove of images and feel good about how far we've come as a community, and what new things the Tower Bridge will represent. This is a guest post by Jaimie Asakawa. Jaimie Asakawa is an enthusiastic member of Metro EDGE. She loves learning about the history of Sacramento and biking along the River Trail.